The city of Nice is one of those places that’ll blow your mind from the get-go. No matter how much you may have been told about its dreamy beaches or the relaxed vibe and the good life that you’ll find there, to actually experience it is a very different thing. Luckily for you, with Iberia you can plan an escape to Nice with just a click. And Nice is no small potatoes. After all, it is the fifth city in France in terms of the number of inhabitants, and one of the few places that can boast of having everything: good weather, beaches, attractions for almost everyone and a gastronomy that will take away the desire to return home. Could it all be a dream? That is the impression you will get when you visit Nice and discover its many charms. To begin with, be aware that shopping in Nice demands an almost obligatory visit to the Flower Market, a good way to start the morning and find everything in the long list of requests that blew up your Whatsapp just before your departure: cheeses, preserves and all kinds of gourmet delights that you’ll struggle not to devour until your return home (assuming, of course, that your country of origin permits the importation of such goods). But since you had the good fortune of actually being there, save something for those who didn’t have the luck to accompany you in this new traveling adventure. And speaking of culinary delicacies and delights, one thing you have to do in Nice is sink your teeth into one of its famous soccas, the city’s quintessential dish of excellence. It is prepared, crepe style, using chickpea flour and olive oil, and it’s recommended you combine it with a delicate rosé wine. There are many establishments that prepare it, so… where to start? Ask a local and they will tell you the best options. 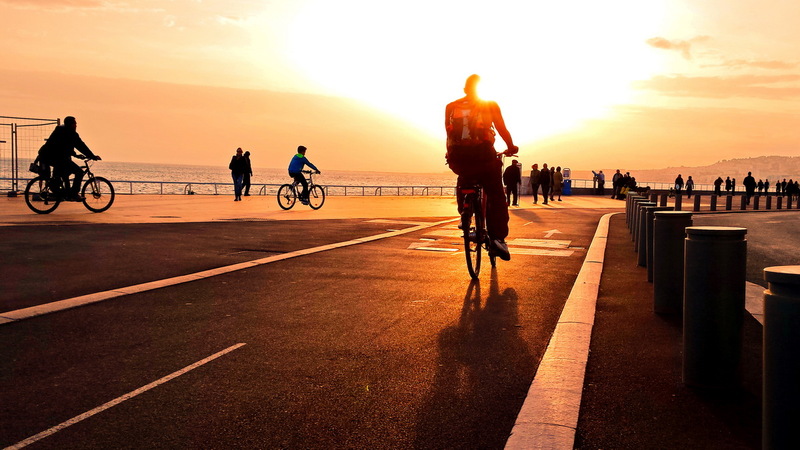 And to enjoy the coast of Nice in a different way, you can always rent inline skates and skate your way along the more than two miles (four kilometers) that cover the famous Promenade des Anglais from end to end. You will easily find rental shops for skates and bicycles, which are another good way to get around in Nice. If after visiting the markets, sampling the delicious socca at lunchtime and rollerskating the afternoon away you still want to continue enjoying Nice, the city’s vibrant nightlife remains very active almost every day of the week. And not only do venues close late (around 2am), but the partying continues on the beaches. So, what do you say? Do we fly to paradise together? Since this postcard destination is so close to Spain, maybe it's time to head to Nice. Iberia joven 2019 ©. All rights reserved. Forgotten or do not have a PIN?